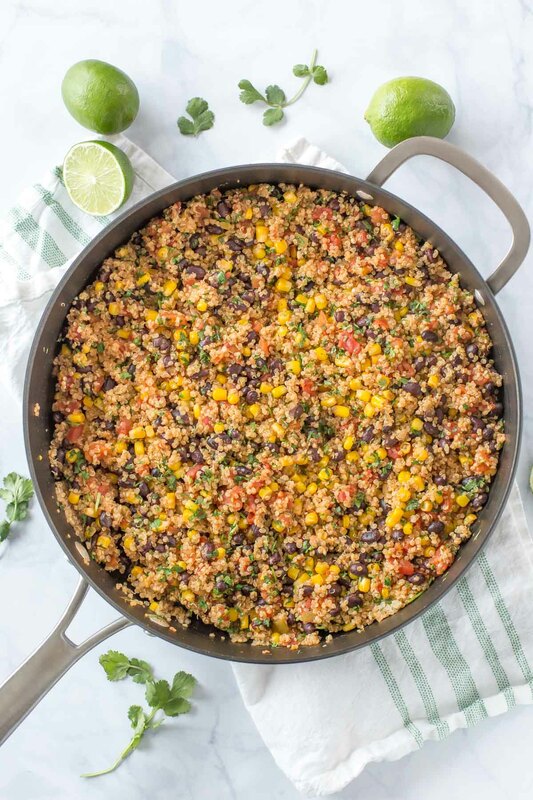 Loaded with black beans, tomatoes and corn, this one pot, dairy free Mexican quinoa recipe comes together in just over 30 minutes. It’s makes an awesome side dish for any meal or a filling, vegan main dish that’s perfect for week day lunches. Makes 8 servings. This post was originally published November 9, 2013. It has been updated to make it dairy free. Pair that with some Mexican mix-ins and you have a healthy, meatless meal. Or you can serve this as a side dish with your favorite fajitas recipe. This quinoa recipe is super easy. After sautéing some minced garlic a tablespoon olive oil, you add the rest of the ingredients the pot and bring it to a boil. Then, reduce the heat, cover the pot and let it simmer until the quinoa is cooked. It should take about 25 minutes. When it’s finished cooking, stir in some fresh cilantro – if you want – and you’re ready to serve. 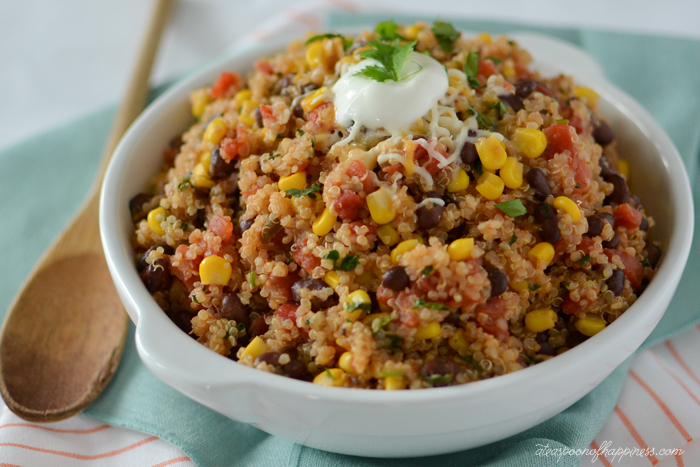 So what makes this Mexican quinoa dairy free? The original recipe from this post suggested topping your quinoa with sour cream and cheese, which is obviously no good for a dairy free lifestyle, but luckily this was easily remedied. The actual recipe didn’t need any changing, and it is just as good without those milk-based toppings. Feel free to top it with guacamole, your favorite aioli, or vegan cheese for an extra pop of flavor. I topped mine with a cilantro lime aioli, and it was the most amazing thing I’ve ever tasted. Recipe coming soon, I promise. 1/4 cup chopped fresh cilantro, for garnish. In large skillet or saucepan, heat the olive oil to medium-high heat. Add garlic and sauté until fragrant – about 30 seconds. Add remaining ingredients (minus the cilantro) and bring to a boil. Reduce heat to low, cover and simmer for 20 – 25 minutes. This looks amazing and your blog is gorgeous – I love it! Looks yummy… will give it a try asap! This looks delicious! One helpful hint that I found on pinterest! is to rinse the quinoa 3 times!! 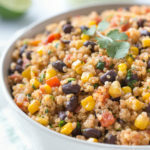 I mentioned this to a friend and the last time I saw her, she said she always thinks of me when she makes quinoa because it tasted so much better after rinsing it 3 times;-D Thanks for sharing your recipes! You can buy frozen quinoa at Trader Joe’s that can just be microwaved 🙂 It’s super yummy. I could never get the rinsing right and my quinoa was always bitter. Just made this and I was surprised how good it came out! I have been looking for a good Quinoa recipe, tried a few that didnt come out very good. Thanks for the recipe! I made this with no changes. It was a very tasty and hearty dish and was even better the next day! Thanks! I made this with a can of Green Chili enchilada sauce instead of tomatoes and green chilis, and no cilantro (didn’t have any) and it was yummy! I added 1/2 cup of mild salsa. My entire family loved it. Thanks for a great recipe! I’m a fitness and nutrition coach. I’m always loooking for healthy recipes to share with my clients. This looks amazing! Very good! I just used about 1 c of diced organic tomatoes from a jar so I needed to compensate and add more garlic and more salt. Oh, and I added chunked avocado to the bowl! But it got rave reviews from my kids. Love that!!! I just made this! I left out the cheese and corn It was abdolutely delicious!I did all avocado with frest cilantro at the end. Ive posted a picture of it on my fb and ranted and waved to my friends! Thank you!! This was sooooo good! The last time that I made quinoa, it was horrible. I came across this recipe, and thought that I’d give it another shot. This did not disappoint. It will make for a good Lenten meal. Thanks for sharing! So glad I found you! Its hard to find a blog with yummy and healthy dinners! Thank you! Thanks so much! That’s so nice to hear. I promise I will keep the healthy recipes coming. 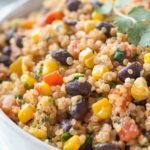 Mexican Quinoa | Bon Appetit! This was so delicious! Thanks so much for sharing! I will definitely be making on a regular basis. I did add extra cumin and a diced jalapeño pepper. So good! I made this a couple weeks ago and loved it! Thinking of trying in the crockpot…anyone tried that? DietBet: Week 3 | Seriously, Sarah? This recipe sounds great but I would be interested in seeing the nutritional information especially the sodium levels. Just reviewing the ingredients it looks like it would be very high. I made this last night and it was absolutely amazaing. I used fresh tomatoes and japapeño peppers instead of Rotel and I added some oregano and a Tbs of lime juice at the end. I topped it with cubes avocado. It was divine (and I’m not even a quinoa person). Thanks for sharing the recipe. This looks delicious, but I wish people would stop calling dishes with black beans “Mexican.” My wife is Mexican and she corrects anyone who calls a dish with black beans Mexican food. Black beans are a staple in Latin American cuisine such as South American, Puerto Rican, and Cuban food. Pinto beans, not black beans, are the staple of Mexican cooking. This is a favorite with my husband and I! It’s so yummy, and makes enough for lunch the next day! I used to make something similar with white rice. I love that this recipe has quinoa- much better for you! This is a a quick, easy, healthful meal that my husband and I really enjoyed last night. To make it even easier for me, I utilized my rice cooker for this quinoa dish. I sauteed the garlic in a small pan, then added it with the other ingredients (except for the toppings) into my rice cooker, put the lid on, flipped the switch to “cook” and in about 40 minutes our dinner was ready to eat. Thanks for a great recipe that I will be using again and again! Fave & Easy Recipes: Losing Weight | Seriously, Sarah? My ten year old granddaughter is allergic to gluten so it’s hard to find things she can eat. 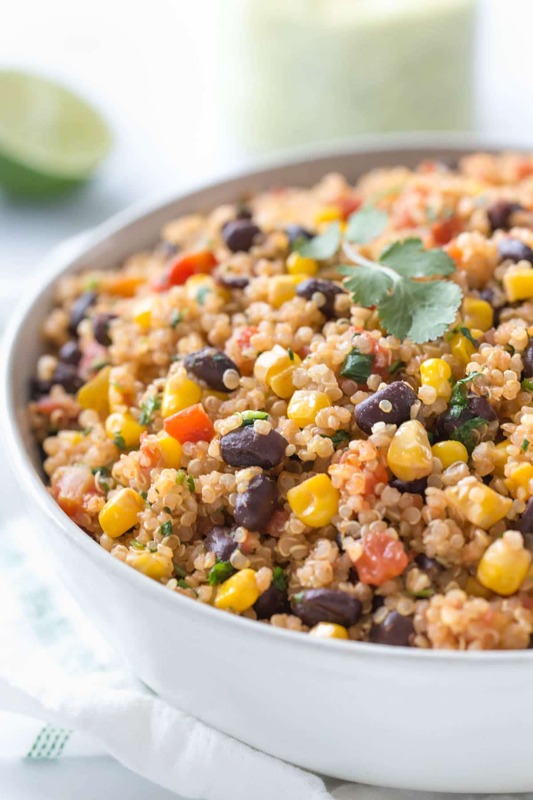 She loved this recipe and says quinoa is now her favorite thing to eat. This recipe does not state that you should cover while it is simmering. If you go to the other site where this was adapted from you will see that you need to cover until almost all liquid is absorbed. I have crunchy quinoa 🙁 such a waste of money. Lesson learned. I’m so sorry the recipe didn’t turn out! I am going to amend the recipe to include specific instructions to cover. It was just an oversight on my part. I really hope you try it again sometime with the pot covered. I promise it’s worth it! Just made this and it was wonderful! I just moved and didn’t have all of the ingredients so I substituted fresh tomatoes and a bell pepper for the canned diced tomatoes. 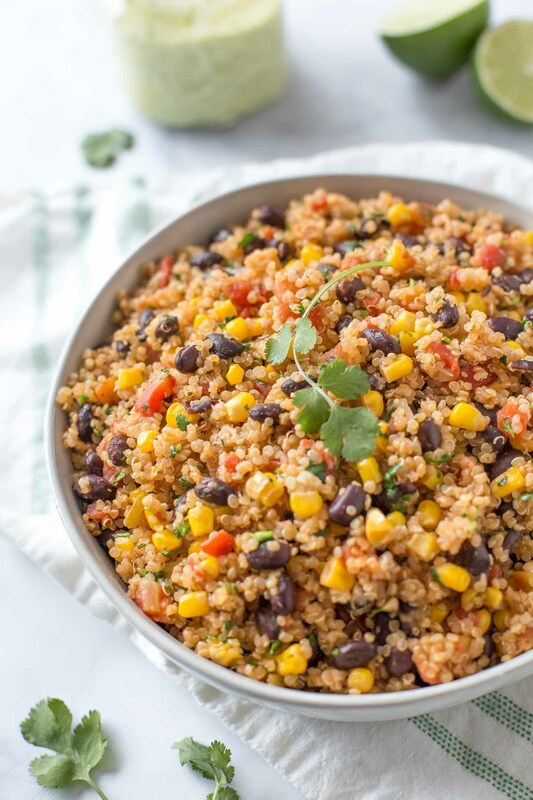 I have struggled with properly cooking quinoa and almost gave up until I stumbled upon this on Pinterest last night and had to try it for lunch. Thanks for the help! This recipe was delcious! I added some red pepper flakes (a pinch) and some cayene pepper(1/4 tsp) to give it a little bit more of a spicy flavour, and it turned out awesome. Dad even ate it and hes no a quiona lover! 2 thumbs up! Thanks for the recipe!! Made this for dinner tonight. Soo yummy! Thanks for sharing the recipe. How much would a serving be? Looks yummy, I want to try this out next week. That really depends on how you serve it. If you’re serving it as a side dish, I’d say about 1 cup. But, if you’d like to serve it as a main dish, I would say closer to 2. I have made this dozens of times and just wanted to thank you for the recipe! I like to use Mexican Ro-Tel with cilantro and lime to kick up the flavor a little more. I didn’t even know they made that kind of Ro-Tel! I think I’ll have to try it next time. That sounds great! Thank you! I love hearing that people enjoy my recipes 🙂 Thanks for brightening my day! Absolutely love this recipe! So much flavour and healthy, can’t beat that! This is so pretty! I love new quinoa recipes, so thank you for this one! 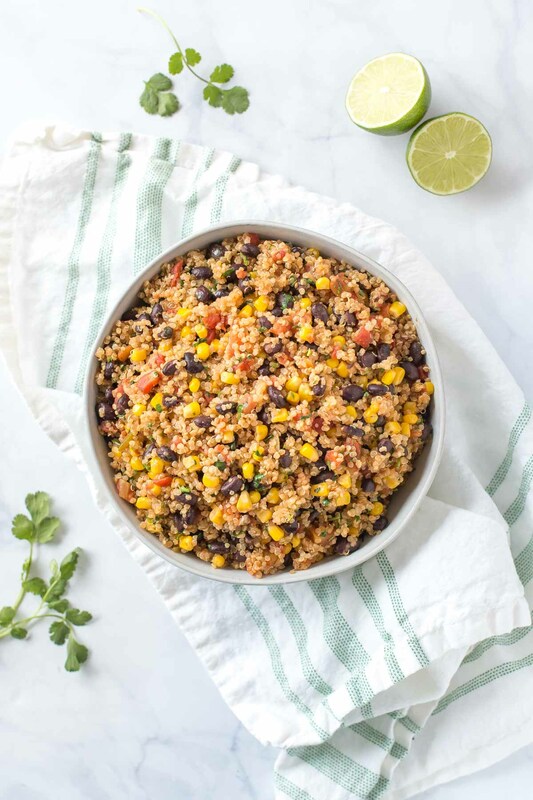 Love this version of Mexican Rice using Quinoa!!! A side dish we will be trying next taco night!! !